For the college students it is not easy to know about the professional world, while maintaining their grades at the same time. The job hunting process can be an easy task for those who are working in a career. It also makes the situation more familiar while talking with the employers. The on-campus services jobs are one among the best jobs for the college students. Looking for more part time jobs for college students? College students can also start working as a waiter or waitress in restaurants and hotels. 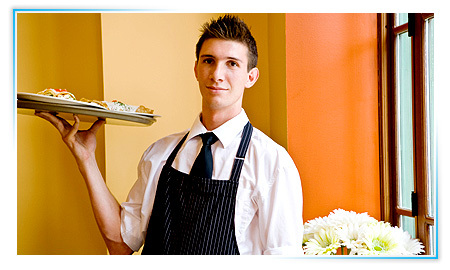 Many college students work as a waiter or waitress in their spare time. It is an honest job students should not turn their nose doing this work. You can earn a good amount of money along with continuing your study in colleges. You can often come at the job in your off time. These kinds of job opportunities also help to gather the experience of the real world. Lab assistant jobs also prove to be great alternatives for college students. The lab assistant jobs are part time in nature. The position of a lab assistant needs only a high school degree. Many colleges often hire lab assistants in campus research labs. The experience can be more attracting to employers. If you are an expert in certain subjects or have the command on those subjects you like the most tutoring is the best way to earn part time income. You can share your knowledge with your fellows or others pursuing study in the same college. It also chances you to join your college official program. All though students can raise or asks bothering question to you. The hours are not fixed, and it is not that the tutor works hours and hours every week. Comparatively the salary of the tutor often gets up-down from 15-30 dollar an hour. A college student can also find a job in banks for the position of bank tellers. There are banks which offer bank teller jobs. At least 1 in 4 tellers work part time. So there is flexibility of jobs for the students in banks too. This work makes you habitual and familiar with customers. You will earn money along with gathering great experience on how to communicate with the customers easily. Sometimes students who are interested in working in the financial industry get their feet wet as tellers. To help you find a new job, given below are some essential steps on how to go about finding it. Do you have your career goals clear in the mind? Are you able to figure out the balance between your life and your career? It is important to ask yourself questions like these and make an assessment of your life and career. Where do you see yourself pursuing a career 6 months down the line or in the next 6 years? Conduct a research on job options and employers you are targeting. And remember to have realistic expectations while trying to find yourself a new job. Professional networking is an essential part of job hunting process. Understand the value of professional networking and how it helps people in finding jobs. Around 70%-80% people acquire jobs with the use of their network. Spend time and make sincere efforts to reconnect with and expand your network. Strengthen the network and try to build credibility. Continue acquire more knowledge and obtain new skill sets. Today, employers are looking for candidates with strong interpersonal and soft skills. Get yourself trained in written and verbal communication, team playing, problem solving, analytical skills etc. Job hunters overlook this important part most of the times. While finding and applying for jobs, you need to practice for job interviews more and more. Before you land up at the employer’s, do some research about the whereabouts of the company and prepare accordingly. Select a faithful friend to practice interviewing. Keep on practicing until you become confident. Get ready with some intelligent questions to ask the interviewer as well. You may have great potential and talent. But having skilled is not enough alone. You should know how to market your skills to the employer. To successfully find a job, you should stand apart from the rest of the jobseekers applying for a specific job. While trying to find a job, remember to follow the above mentioned steps and you are definitely going to find one for yourself. It is very essential to have a job hunting strategy in place so that you do not unnecessarily spend a long time on finding jobs get more career benefits. You might have read the first part on best college students. In this post, we will know about 5 more best jobs for college students. All the jobs mentioned in the earlier post and here suit students the best. When employers hire candidates they prefer those who already have some real world experience, apart from those good grades. So, these college student jobs give students the opportunity to acquire some professional world experience while they continue with their studies in college. Let’s have a look at some more best jobs for college students. The job of a lab assistant can really provide students with research experience that most of the employers look for. So, if you wish to kick start a career in the field of laboratory sciences, you can always go for this job. You find a part time lab assistant’s job both off campus and on campus. Many colleges also offer campus lab jobs as part of their work study programs. An easy but useful job opportunity for students is to seek the position for a professor’s research lab assistant. While assisting the professor with the research work, college students do not only learn and acquire skills, but they develop an advantageous connection with the professor as well. What’s more the professor’s recommendation can really help you a lot in your professional career later. The professional connection may also bring better business and job opportunities to students. Are you aspiring to make a career in the field of healthcare? If the answer is ‘yes’, you can also take up the part time job of a home health aide. By working with an elderly and taking care of them, you can really gain some useful insight and experience in patient care. This experience can help you land home health aide jobs in the healthcare industry as well. While in search of part time student jobs, you can also check out working opportunities with the school paper or with the campus publication. The experience that you gain doing the writing at these places can really look good on resume if you are planning a career that requires good communication skills. Students can also find a lot of writing and editing work online. Yet another best part time job for college students is that of a bank teller. A bank teller’s job provides flexibility to students. The part time job helps students acquire some customer services experience that can be useful in their career later. While taking up any of the above mentioned part time jobs, college students should remember to select an option that has relevancy with their chosen career path. If the job is relevant to your future career, you are definitely going to benefit from these real world experiences. There are some of the best jobs that really look good on a student’s resume. Today, students are not only required to obtain good grades but need to have some professional experiences as well. Hiring managers are looking for candidates that are already trained in the basics of life on a job. Given below are the best jobs for students that not only add weight to the student’s resume but also offer decent pay and work around class schedules quite well. These work study jobs prove to be one of the best for college students. They help students acquire some real world experience while they continue with their education. Technology services work train students on how to solve technical problems. On campus IT support jobs prove to be convenient and are quite lucrative that those unpaid off-campus internships. It is quite obvious that students find it hard to acquire professional world experience while working to obtain good grades. Working in career services enables students to become aware of the job hunting procedures and provides them with comfortability while conversing with employers and recruiters. This is really one of the best jobs for college students who want to gain professional world experience and expand the working world connections. What’s more if the job matches the career you wish to pursue there’s nothing better. Paid internships also help decide students whether a career is actually right for them. And students not only acquire knowledge and real world experience but they are also paid while taking up paid internships, truly one of the best for college students. This is one of the best options for those students who are not actually looking to fill their wallet. The good news really do not care or ask you whether you were paid or not during that internship. All that matters is how much real world experience you can gain. Summer internships and part time internships are some of the best options for students. Unpaid internships are definitely going to pay off later in your career. This is honest and hard work. A hard work history informs employers that you do not take things for granted. While working as waiters or waitresses, you can gain a lot of real world experience as well as earn a decent income. Definitely, the waiter or waitress’ jobs are one of the best for college students.